iPhone "Face ID Is Not Available"? Here's The Real Fix (For iPads Too)! You are at:Home»iPhone»Settings»iPhone “Face ID Is Not Available”? Here’s The Real Fix (For iPads Too)! Face ID isn’t working on your iPhone or iPad and you don’t know why. No matter what you do, you can’t unlock your device or set up Face ID for the first time. 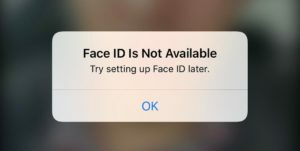 In this article, I’ll explain what to do when iPhone “Face ID Is Not Available”. These steps will help you fix Face ID on your iPad too! Restarting your iPhone or iPad is a quick fix for a minor software glitch that could be the reason why Face ID is not available. On iPhones, simultaneously press and hold the side button and either volume button until the “slide to power off” slider appears on the display. Swipe the circular, white and red power icon from left to right to shut down your iPhone X, XS, XS Max, or XR. Press and hold the side button until the Apple logo appears on the screen to turn your iPhone back on. On iPads, press and hold the power button until “slide to power off” appears. Just like on an iPhone, swipe the white and red power icon from left to right to turn off your iPad. Wait a few moments, then press and hold the power button again to turn your iPad on again. If your iPhone’s or iPad’s TrueDepth camera is obstructed, Face ID won’t be able to recognize your face, so it won’t work. The TrueDepth camera is located in the notch on the iPhone X, XS, XS Max, and XR, and at the very top of your iPad when you hold it in Portrait orientation. Let’s make sure the top of your iPhone or iPad is completely clean and clear! First, grab a microfiber cloth and wipe off the notch at the top of your iPhone’s display. Then, make sure your case isn’t obstructing the TrueDepth camera. Another common reason why Face ID might not be available is because something is covering your face. This happens to me quite often, especially when I’m wearing a hat and sunglasses. Take off your hat, hood, sunglasses, or ski mask before trying to set up Face ID on your iPhone or iPad. If your face is clear and Face ID is not available, move onto the next step. Face ID only works when you’re holding your iPhone or iPad in Portrait orientation. Portrait orientation means holding your iPhone or iPad vertically, rather than on its side. The TrueDepth camera will be at the top of the display when you’re holding your iPhone or iPad in Portrait Orientation. iOS is the operating system that runs on your iPhone or iPad. 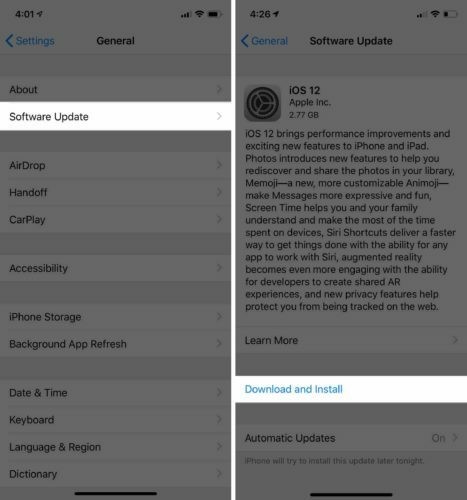 iOS updates introduce new features and sometimes fix minor or major software problems. Head to Settings -> General -> Software Update to see if a new version of iOS is available. Tap Download and Install if a software update is available. 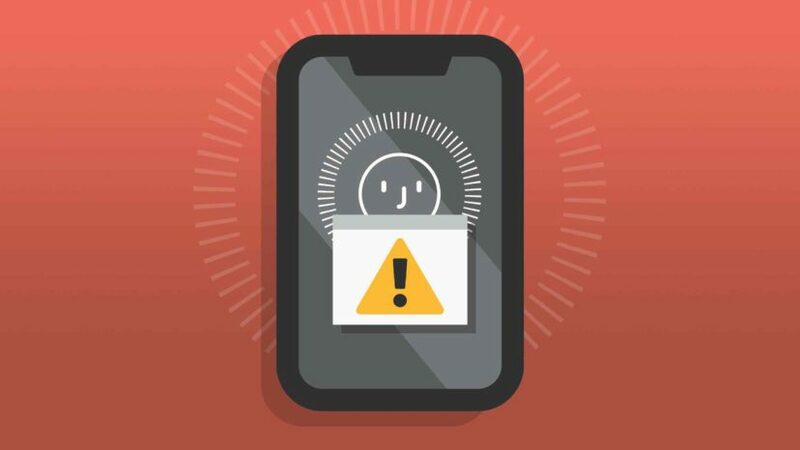 Our final software troubleshooting step when your iPad or iPhone says “Face ID Is Not Available” is to put it in DFU mode and restore. A DFU (device firmware update) restore is the deepest restore you can perform on an iPhone or iPad. It erases and reloads every line of code on your device, giving it a completely fresh start. I recommend saving an iPhone or iPad backup before putting it in DFU mode. When you’re ready, check out our step-by-step DFU restore guide! If you’re troubleshooting your iPad, check out our video on how to put iPads in DFU mode. You’ll probably have to take your iPhone or iPad into your nearest Apple Store if it still says “Face ID Is Not Available”. There could be a hardware problem with the TrueDepth Camera. Don’t delay in setting up an appointment at your local Apple Store! Apple will swap your faulty iPhone or iPad with a brand new one, if you’re still within the return window. Apple also has a great mail-in program in case you can’t make it to a brick and mortar location. Face ID is available on your iPhone or iPad and now you can unlock your device just by looking at it! Next time “Face ID Is Not Available” on your iPhone or iPad, you’ll know how to fix the problem. Feel free to leave any other questions you have about Face ID down below in the comments section! Previous ArticleMy iPad Screen Is Blurry! Here’s The Real Fix.